I really enjoyed Marco Arment’s Christmas list and the idea of only reviewing things he’s used for a long time. Here’s the stuff that’s either been in my bag for a long time or has seen heavy use. I beat the hell out of the things I own. Most things break or eventually piss me off, these things didn’t. If you want a practical gift for someone that will work well and be a part of their lives for years to come I’d get something from this list. Tom Bihn Daylight Pack: All Tom Bihn luggage is fantastic, but my current favorite pack is the Daylight. It’s just exactly what a pack needs to be and nothing more. At 381 grams my pack weighs less than an iPad Air and is (just!) enough space to fit everything I own. Check out my full review. Every other piece of luggage from Tom Bihn is also phenomenal but all of it is heavier. I’ve personally used and can vouch for the Aeronaut, Synapse 19 and Smart Alec. 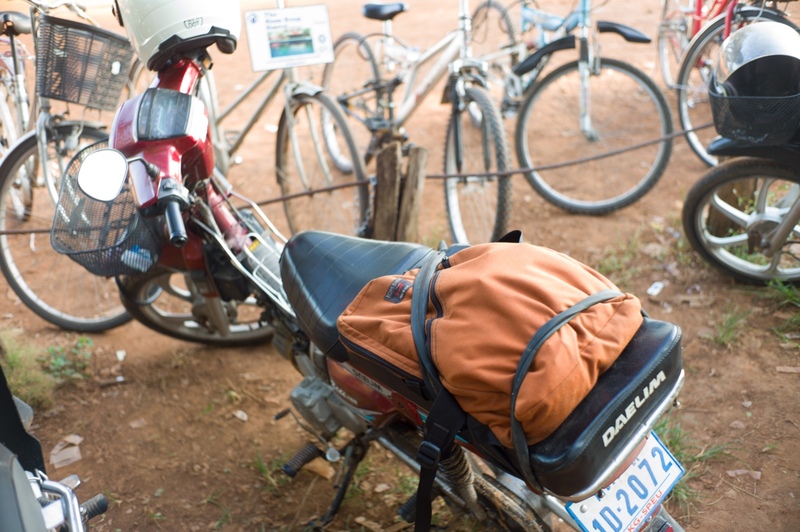 My Tom Bihn Daylight pack strapped to the back of a Daelim 100cc motorbike. Rohan Stronghold Trousers: I’ve only worn one pair of pants for the past seven months. I’ve wrecked a motorcycle in them, swam through a cave in Vietnam wearing them, and flown more than 30,000 miles in them. The Rohan Stronghold trousers are fanastic. Both the right front and right rear pockets have zippered compartments — the rear is perfect for a passport and the front is perfect for a wallet. The left pocket has a triangle-ring for attaching keys or a flashlight. Nite Ize Flashlight: I bought this last minute at REI in San Francsico and am very glad I brought it along for the trip. Surely, a cell phone works OK as a flashlight too but isn’t nearly as bright. This little flashlight runs forever on a AAA battery. I used it to illuminate the bottom of a cave in Vietnam, for “light painting” trees, and in my mouth as an emergency headlight while driving through Cambodia at night. Merkur Classic Safety Razor: I don’t carry a razor on the road because bringing blades through Airport security is a huge hassle. But I deeply miss my Merkur safety razor. Paired with good blades nothing cuts a beard down like a single-blade safety razor. If you don’t like to shave for weeks and then decide to shave, get a Merkur and a badger brush. You will never want to go back. Persol Folding Sunglasses: As a photographer I rarely wear sunglasses since it interferes with my ability to see light. When I do need them polarized glasses are much better than regular cheap shades. They make it much easier to distinguish shade from rough pavement on a motorcycle and help see rocks in water. I’ve owned two pairs of Raybans and these Persols. Get the Persols: they look cooler and last longer.